HALIFAX, May 4, 2016 /CNW/ - A collaboration of ten industry, government, and Indigenous partners announced today the launch of an education and apprenticeship program to create job opportunities for 20 Indigenous students in metal fabrication. The program, offered through the Nova Scotia Community College (NSCC) Akerley Campus in Dartmouth, offers successful students the unique opportunity to build a lasting career in shipbuilding at Irving's Halifax Shipyard. The cohort based pilot program integrates education, industry and community partnerships to develop a model that successfully creates pathways for Indigenous Canadians to enter the shipbuilding industry. Over the course of the two-year program, participants will learn and work together, and be mentored and coached by community and industry supporters, including Indigenous employees working at the Halifax Shipyard. In the next three to five years, Irving Shipbuilding Inc. anticipates that the industry will undergo significant growth as a result of the National Shipbuilding Strategy. In anticipation of this, Irving Shipbuilding's Centre of Excellence is dedicated to providing pathways for Nova Scotians to enter the shipbuilding industry, with particular focus on under-represented groups. The "Pathways to Shipbuilding" collaboration includes: Irving Shipbuilding Inc., GE Canada, Unifor, Nova Scotia Community College, Indigenous and Northern Affairs Canada (INAC), Employment and Social Development Canada (ESDC), Aboriginal Affairs (OAA), the Nova Scotia Apprenticeship Agency, and Labour and Advanced Education (LAE). 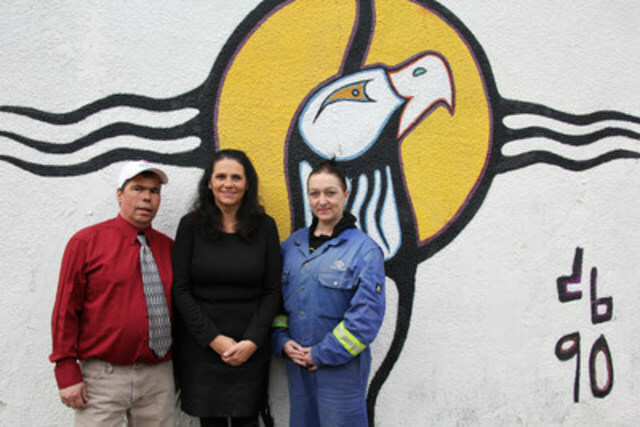 The Mi'kmaq Native Friendship Centre in Halifax is the community partner for the program and will be managing – in collaboration with other Indigenous organizations – the recruitment process and providing support services to the students in Halifax. A fourteen week customized introductory program will be followed by the two-year metal fabrication program at Nova Scotia Community College's Akerley Campus. Successful graduates who meet employment eligibility criteria will be employed by Irving Shipbuilding at the end of the two-year diploma program as positions become available in 2018 and beyond. Funding for this pilot program will come from a variety of funding partners, with a mix of new funds and existing government programs. "Working in partnership to enable Indigenous people to obtain the necessary skills to work in this important industry is critical to support economic reconciliation in the region. Indigenous and Northern Affairs Canada is pleased to be a partner in the "Pathways to Shipbuilding – Indigenous Education and Apprenticeship Pilot Program. This pilot program is a great example of what can be accomplished by working towards a common goal in collaboration with community-based Indigenous organizations, industry, other levels of government, unions and post-secondary institutions." "We are always striving to create opportunities for the Mi'kmaq of Nova Scotia and we are pleased that the Mi'kmaq Native Friendship Centre will become the community partner in this important program." "This initiative will help to build on the good work underway between government and Aboriginal communities across the province to create opportunities for young people in the skilled trades. I hope more employers will follow the lead of Irving Shipbuilding and develop new pathways to increase apprenticeship opportunities for underrepresented groups in our province." "Like our partnership with Women Unlimited, ISI and Unifor, I know this new opportunity will open doors for individuals in our province who will, in turn, invest the skills and education they receive back into the success of this immense national project". "We all benefit from diversity in the workplace. If we are going to be successful, it is imperative to develop new business models such as "Pathways to Shipbuilding" which is a supportive, collaborative approach where we will all learn together. Ultimately we hope this model will create greater opportunities for Indigenous Canadians to participate in businesses across the country." "We pride ourselves in training the best and brightest to be Canada's next shipbuilders. By ensuring equal representation and opportunity, we are able to fully utilize the diverse talent across Canada to build a capable workforce for constructing Canada's future navy". "As the union that represents the workers at the Halifax Shipyard, Unifor is excited to be a part of this innovative project and partnership. We know equality and diverse workplaces that reflect our communities don't just happen; they come together when people take action to build them. Unifor is proud to be a partner in building this one".